The "Advances in Group Processes" series publishes theoretical analyses, reviews and theory-based empirical chapters on group phenomena. 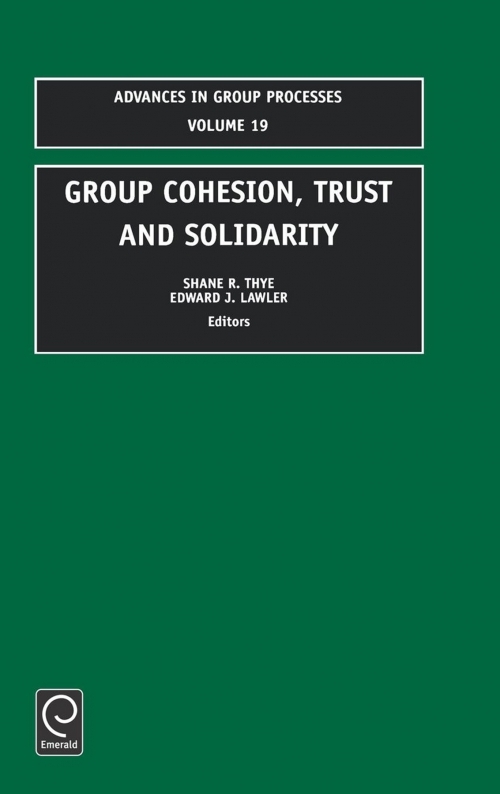 Volume 19 includes papers that address fundamental issues of solidarity, cohesion and trust. Chapter one shows how solidarity is a consequence of group-level phenomena (competition) and individual level phenomena (similarity). The second chapter examines solidarity among injection drug users, showing that the cohesion and solidarity of drug users are patterned by principles of collective action. The next two chapters integrate extant theories to provide new insights. Chapter three integrates principles of social exchange, status organizing processes and game theory to theorize solidarity; while chapter four shows how research on emotions can explain solidarity in status-differentiated groups. Two chapters then review and analyse long-standing programmes of research on cohesion and trust. Chapter five reviews a decade of growth for the theory of relational cohesion, showing how emotions lead to cohesion and commitment. Chapter six analyses how learning and social control can produce trust in networks of varying size. The final two chapters examine processes that are often neglected in the production of solidarity and cohesion. Chapter seven analyses group loyalty as a function of intra- and inter-personal factors. Chapter eight examines how relatively subtle features of speech arrangements can either maintain or disrupt solidarity. 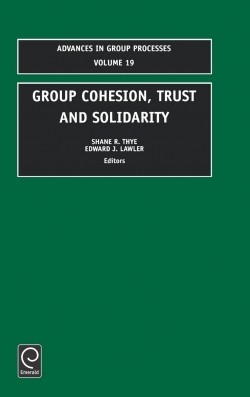 Overall, the volume includes papers that reflect a wide range of theoretical approaches to solidarity and contributions by scholars that work in the general area of group processes. Cohesion and membership duration: linking groups, relations and individuals in an ecology of affiliation, M. McPherson, L. Smith-Lovin; Group solidarity as the product of collective action - creation of solidarity in a population of injection drug users, D.D. Heckathorn, J.E. Rosenstein; Building a model for solidarity and cohesion using three theories, D. Willer et al; Status, emotion and the development of solidarity in stratified task groups, J.A. Houser, M.J. Lovaglia; The theory of relational cohesion - review of a research programme, S.R. Thye et al; Embedded trust - control and learning, V. Buskens, W. Raub; Group reactions to loyalty and disloyalty, J.M. Levine, R.L. Moreland; Sequence and solidarity, S.E. Clayman.